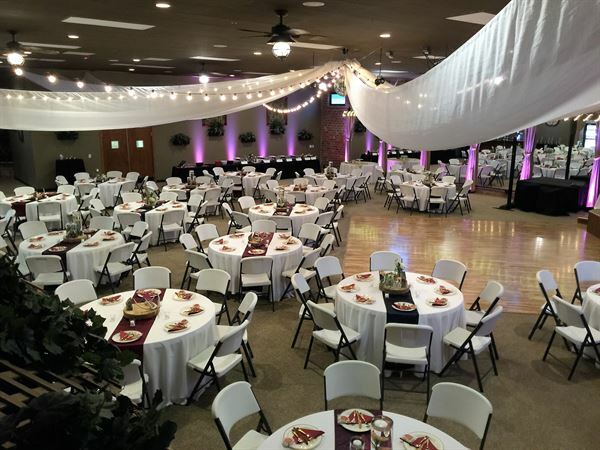 The Garden Room is a 6,500 square foot venue located in Loveland, CO. We cater to people who like flexibility to control all aspects of their event from catering, to refreshments to entertainment. We have a state of the art A/V system, Kitchen, Bar and dressing rooms for both bride and groom. We only have one event a day so you have the room for 10-12 hours for set-up, event and clean-up. Our venue has 180 parking spaces and is close to 6 hotels and easy interstate access. We are open from 4-7pm on Tuesday and 12-3pm on Saturdays for drop-in tours, no appointment necessary. For other times just call and schedule an appointment. 50% of the payment is due upon booking the balance is due 2 weeks before the event. This package id for larger events and includes ceremony & rehearsal, tablecloths and up to 200 guests. Additional guests above 200 are $10 per person up to a maximum of 250 guests. This package is for weekday meetings. The prices start at $100 per hour minimum of 5 hours. There is a $5 per person charge over 120 people.